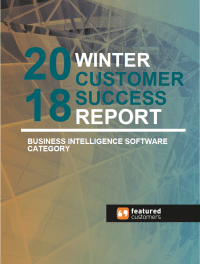 Entrinsik Informer has been named a “Top Performer” for business intelligence tools in the 2018 Winter Customer Success Report published by FeaturedCustomers.com. FeaturedCustomers.com’s Customer Success Report is based on the curation of authenticated case studies, testimonials, and reviews from across the web, telling a complete story of vendors in the BI space through real customer experiences. Scores are determined through a number of factors including number of reviews, customer success content, social media presence, and vendor momentum based on web traffic and search trends. FeaturedCustomers.com is the number one platform for finding and reviewing IT software through verified customer success content. With nearly 200,000 customer endorsements from some of the most recognized brands, FeaturedCustomers.com helps its prospective users make informed IT purchasing decisions. The Top Performer designation in the Customer Success report is awarded to vendors with significant market presence and resources and enough customer success content to validate their vision. Highly rated by customers, Entrinsik Informer consistently publishes customer-driven content and curates dozens of positive reviews from multiple third-party sites. “We are once again honored to be recognized for our dedication to the success of our customers and are excited to be included in FeaturedCustomer.com’s report. “The team at Entrinsik works very hard to help organizations drive greater success by delivering a feature-rich, easy to use business intelligence tools and data analytics solution at a competitive price.” says Doug Leupen, CEO at Entrinsik. Entrinsik Informer simplifies the often complex process of accessing, cleansing, blending and analyzing data from multiple sources with its flexible, extensible architecture and intuitive user interface. Informer enables organizations around the world to extract critical insights buried in data, whether in legacy systems, spreadsheets, or in the cloud. Download the full Customer Success report below, and contact us to schedule a personalized demo of Informer 5 or to start your free 30-day trial using your own data.